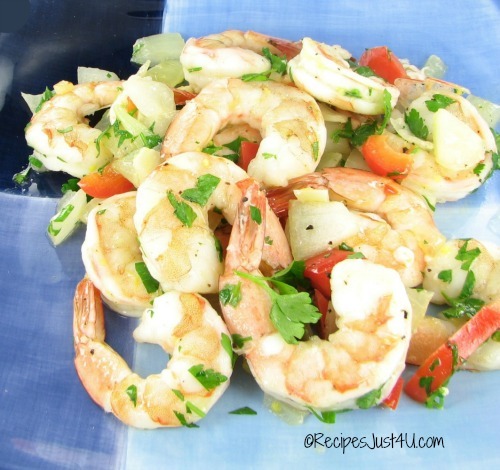 This recipe for garlic lemon roasted shrimp could not be easier to make. The flavor is tart and refreshing and it’s a quick and easy meal that will become a family favorite. My husband and daughter love shrimp recipes and like to eat them often. I am always looking for new and (hopefully) easy appetizers. This recipe could be either a main course or a tasty way to start a party. Treat your Family to Garlic Lemon Roasted Shrimp. If you love 30 minute meals, this is a great one to add to your list of easy recipes. This recipe is also gluten free, Paleo and Whole30 compliant. The dish in on the table in less than 20 minutes but worthy of serving at any special dinner party. Best of all, the shrimp is roasted in the oven. no turning or tending to it. 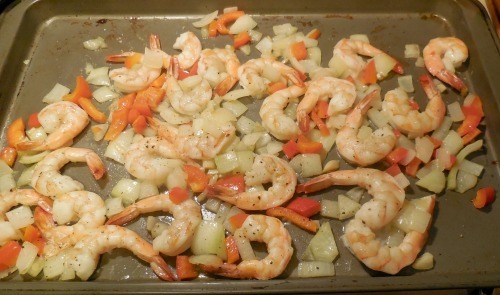 Just saute some onions, garlic and peppers first until almost done and then combine everything on a baking sheet and add the tossed shrimp and roast for about 8-10 minutes at 400 º. 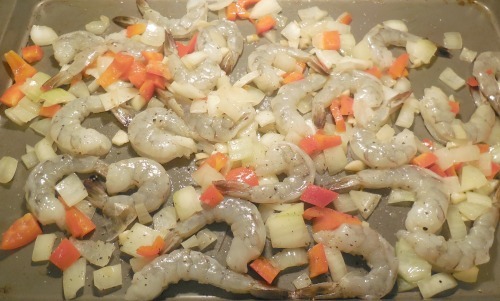 After the shrimp cook for about 8 minutes, they will turn pink and the veggies will be tender. You could serve them just like this, but don’t stop here. Adding fresh minced parsley with some grated lemon zest takes this dish to a whole new level.The shrimp are tender and not at all tough, and the peppers, garlic and onions slightly sweet. The herbs and lemon zest add just the right amount of tang to balance the flavors. My husband RAVED about this dish. This recipe uses a garlic infused olive oil as a base. You can buy it, of course, on Amazon or at any specialty cooking shop but it is also easy to make. Just saute some whole garlic cloves (6 is a good number for a regular sized bottle of olive oil. Cook till it sizzles and then heat in more oil until it begins to bubble. Let it cool and then strain the garlic and place the oil in a bottle. (be sure to save that lovely garlic for another recipe.) You can also cook the infused olive oil in a slow cooker for 4-6 hours and then strain and store. 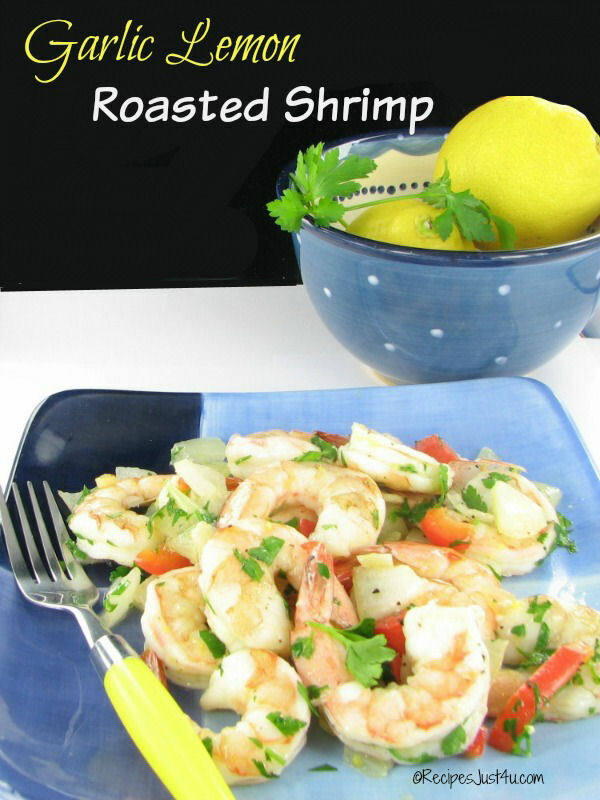 The garlic lemon roasted shrimp is perfect as a main course with a tossed salad and some pasta, or serve it as an appetizer at your next party and wait for the compliments. It’s just delicious. The lemon zest adds a lovely tang to the dish. make a great appetizer. If basil is in season, add a bowl of fresh basil pesto to dip the shrimp in. Magnifique! Red Lobster has nothing on this delicious garlic lemon roasted shrimp! Having a party soon? Try these beer battered coconut shrimp. Heat the extra virgin olive oil in a skillet and add the sliced onion, garlic and peppers. Cook for a minute or two until almost tender and then transfer to a baking sheet. Toss the clean shrimp in the infused olive oil, salt and pepper. Add to the baking sheet and roast for 8-10 minutes. 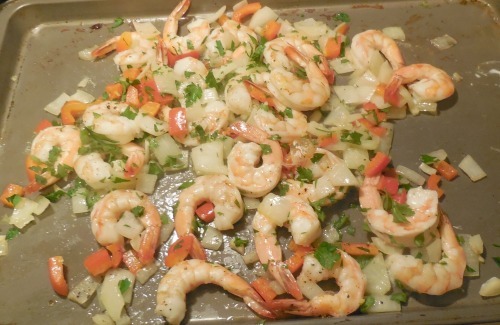 Toss the roasted shrimp, onions, garlic and peppers with the parsley lemon zest mixture until well combined and serve warm or at room temperature. Serve with pasta and a tossed salad. If basil is in season, this is also very nice served with a fresh basil pesto.